Karachi is home to the most diverse of populations across Pakistan. Muslims, non-Muslims, Shia, Sunni, Muhajir, Balochi, Sindhi, Pashtun, Kashmiri, and also many other minority groups; many a people have found home here. Some of them love Karachi, others hate it. But Karachi has embraced them all – giving them the freedom to be themselves. Some folks weave dreams during the day. Some have adopted a nocturnal lifestyle and work during the night. Some read Jane Austen, while some unfalteringly quote Faiz Ahmad Faiz. Some revere and find solace in its shrines. And yet, others destroy the very sanctity of those shrines. Some try to restore its glory, while others try to slaughter this goose to steal all its golden eggs. All of this happens at once, and this diversity is what makes Karachi both beautiful and painful. Vibrant and colourful, yet unpredictable and violent: Karachi is as much love as it is traumatic. This plurality is most evident in the older, more “established” vicinities of the city – where walking craftsmen are seen in abundance. Each of these daily wagers boasts of the most unique skill sets, and in the process, trigger a pulsating energy from within themselves. It’s easy to overlook their presence in the crowd, for their existence has been internalised into the very fabric that makes up the city. So behind every ‘kachraywala’ (garbage-man), ‘rehriwala’ (peddler), ‘phalwala’ (fruit vendor), ‘makaiwala’ (corn seller) and ‘bandarwala’ (monkey charmer) is a story waiting to be told. And this is where Khan comes into play. Khan is the resident mochi (cobbler) in the older part of Clifton, where I live. He deals in an assortment of wares: from mending and polishing footwear, re-doing broken zippers and refurbishing an aged leather handbag, making it seem almost as good as new. Not one of his most regular customers, I visit his location on a strictly need-be bases; a need which arose recently on my way home from work. While I waited for my shoe, I took a few minutes to get to know him. Referred to simply as Khan, the man is reluctant to talk about his craft, which is one of the oldest jobs in the city and usually provides opportunity to settlers coming from the northern areas of the country. 42-year-old Khan took over his father’s mochi business after the latter retired four years ago. As he converses with another customer and the adjoining bun kebab wala, it appears that he has a knack for mending souls, too. Hailing from Peshawar, Khan’s family has been in this business forever and moved to Karachi some four decades ago, when they felt they would have better business here. Being the only mochis in the area for a very long time now gave his family a monopolistic edge in terms of experience, no competition, and a general awareness of the area they worked in. He talks about a time when a cobbler’s business was a dignified business, so to speak. That was apparently when an entire network of mochis existed, each of whom specialised in a particular technique – polishing, mending, or repairing, and no mochi had any qualms about referring a customer to the needed specialist. To quote him, business started declining in the 90s when Bata and Servis became household names. People were suddenly able to polish their own shoes, and shoe stores encouraged people to return to them to get miscellaneous repair work done. If business and resource conditions are conducive, Khan wants to set up his own shop soon. However, as our conversation progresses, I detect a hint of cynicism. He revealed his family has been working in this area since a time when roti cost only 10 ana’s (1/6th of a rupee), and bus fares even less. According to Khan, now even Rs 600 is not nearly enough to survive! 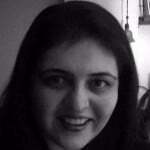 I notice Khan has a very typical Pathan look; with a fair complexion and coloured eyes. He then gives me a 100 watt smile and discloses that when he initially set up his stall, the area was sparsely populated and everything was vacant. He saw the entire area flourish right before his eyes. 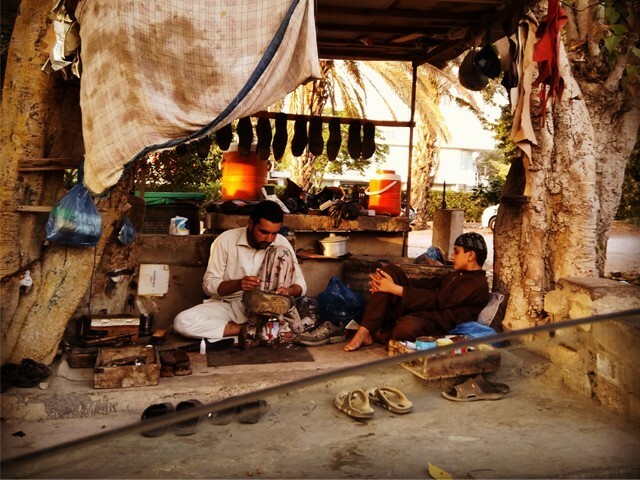 Lost in the alleys of nostalgia, Khan busied himself in finishing up my sandal. In the seven minutes I spent conversing with Khan, I had a sudden ‘aha!’ moment, wherein I realised the very irony of his existence. His “labour” is an integral part of our daily lives; we refer to him by his profession, yet are simultaneously and completely oblivious to his absolute anonymity. I tried to put myself in his shoes and wonder what dreams he, and all those whose professions are stuck under the anonymity of being a ‘wala’, dream of. This had me thinking: Khan appeared to have a strong sense of ownership of his business, coupled with pride and love for the same. Can we somehow emulate these same qualities within our own everyday affairs? And can we then have a domino effect to trigger these same virtues across everyone we work with? Khan suddenly seemed many, many miles away from me. I didn’t have the answers to any of my own questions, yet all this time I took his life as a mochi at face value, sparking a sense of shame and perhaps even embarrassment within me. I quickly looked around to see if anyone noticed, but this is Karachi, after all. Nobody seemed to care, or even know, as I breathed a sigh of relief. In the meantime, as Khan packed my sandals and I paid the meagre amount he quoted – I was ready to finally go home. It is long time that I have read a biographical sketch of an anonymous professional. Thanks Sarah – I am sure there are tons of these “Khans” all over Karachi. It is our responsibility to do even a little bit to uplift their way of life: try to ensure they send their kids to school and learn some trade. I am happy to help. Sarah. I am sorry that you mistook my comment and perhaps felt offended. In fact, I compared you with one of the greatest Urdu writers – Munshi Prem Chand.